A woman carrying a child is escorted by authorities to an apartment following the arrest of a 45-year-old Iraqi refugee, Omar Ameen, Wednesday, Aug. 15, 2018, in Sacramento, Calif.
Ameen could face execution for the "organized killing by an armed group'' according to Iraqi documents filed in U.S. federal court. Prosecutors say Ameen entered the U.S. under a refugee program, eventually settling in Sacramento, and attempted to gain legal status in the United States. 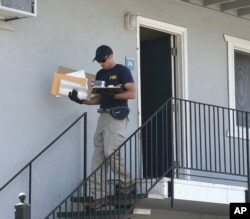 It wasn't immediately clear when Ameen came to the U.S.
A federal agent removes items from an apartment following the arrest of a 45-year-old Iraqi refugee, Omar Ameen, Wednesday, Aug. 15, 2018, in Sacramento, Calif. The FBI has interviewed at least eight witnesses who identify the Ameen family - including Ameen himself, his father, brothers, and paternal cousins - as affiliated with al Qaeda and ISIS, prosecutors said.